• Mass additive (add during mortar preparation), it increases adhesion, watertightness and flexibility. It also increases mortar durability, it prevents shrinkage and crack occurrence. • Primer, to stabilize loose mineral surfaces and lightweight floor screeds (filling materials). 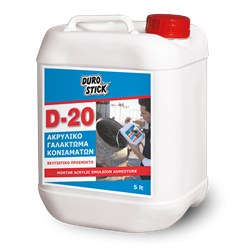 It creates ideal substrates for installing decorative bricks, stones and ceramic tiles, insulating materials etc. • Binding coat between existing and new concrete or mortar.